Sonoran and Mojave deserts of southeastern California to southwestern Utah and south to Arizona and northwestern Mexico. Sandy, barren desert flats and roadsides below 3,000 feet. Two-inch, golden-yellow flower heads appear at the ends of branches. Flowers are composed of 10 to 20 oblong rays surrounding the golden disk. Blooms February through May and sometimes, with moist summers, again in October and November. 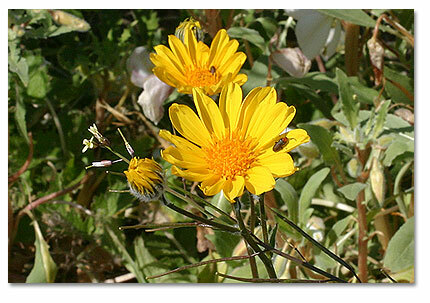 The desert sunflower is a slender, hairy plant that grows 1 to 3 feet high. The sparse, gray-green, ovate, leaves grow to 3 inches long and have toothed margins. "Geraea" is derived from the Greek word for "old man" -- "geraios" -- which refers to the white hairs on the seed-like, flat fruits. The flower of this colorful annual is popular with bees and birds, while the seeds are an important food source for birds and rodents. 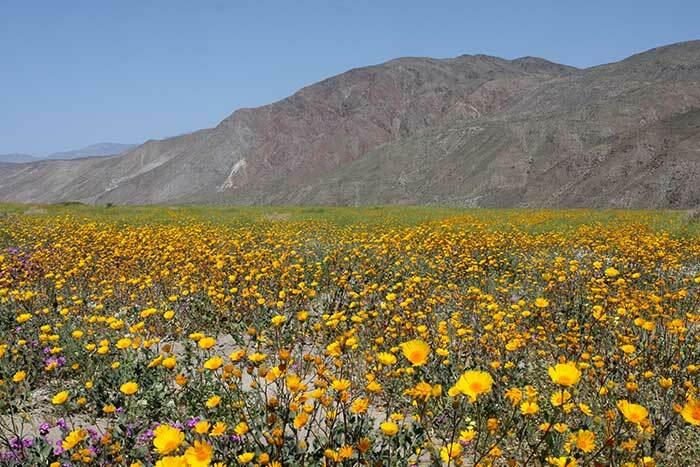 After a spring rainfall, the desert sunflower can be found in abundance along desert roadways and is common along with sand verbena and dune evening primrose. Back to main wildflower report page.